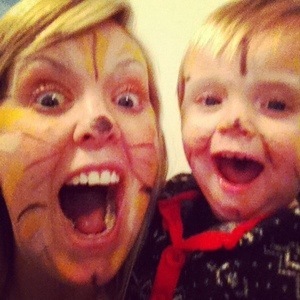 Friday is Dexter Mummy Day and the last one was so much fun I felt compelled to write a blog post about it. The day hadn’t started as planned. I had hoped to take Dexter to the local soft play centre to burn some energy before meeting a pregnant friend for lunch but a group of pushy, horrible mums at the end of their half term tether and their kids (plus the incompetent staff!) made me decide not to spend my cash in there. Safe to say Dex and I are almost certainly banned for life now. I attempted to replicate soft play by visiting the nearest bed showroom and we proceeded to bounce around for 30 minutes. The salesman quickly cottoned on to the fact that we were not there to buy a bed and I felt obliged to take a handful of brochures before scarpering with a toddler under my arm. We then met my fabulous pregnant friend for an early lunch. Dex has been practising a few different laughs lately and he was trying them out on his new audience. I think she liked the sinister chuckle; it’s one of my favourites. Dex adores this lovely lady and is often found clambering all over her for a cuddle. We had a lovely meal before heading to another location for tea and cake (I might have used her pregnancy as an excuse for me to eat.) Dex was as good as gold throughout and enjoyed people watching. We said our goodbyes before heading back home. Dex crashed so I stayed in the car on the drive whilst he slept and abused our strong Wi-Fi connection, my PayPal account also took a bit of a hit. I had a few ideas of what we could do together for the rest of the day but wanted to leave it to Dex to decide. 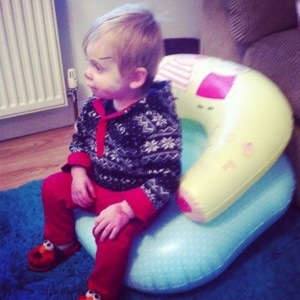 It’s bloody awesome having a little person that can communicate and understand what you’re saying….most of the time. Dex has come on leaps and bounds recently. He has a perfect little voice and gets so excited when you understand what he’s talking about. Once inside I laid out crayons and paints. The boy chose the latter and happily created “art” for half an hour. 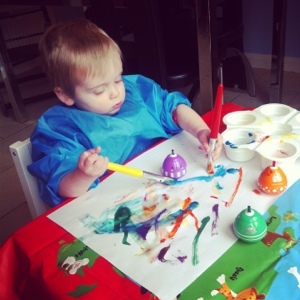 He didn’t make much of a mess and was actually very careful and precise about where he was putting the paint. Unlike his mother who dropped the pallet on the floor. Duh. After some biscuits and serious cuddles I asked Dex if he wanted to be a tiger, to which he replied “grrrrrr”. I took that as a yes. 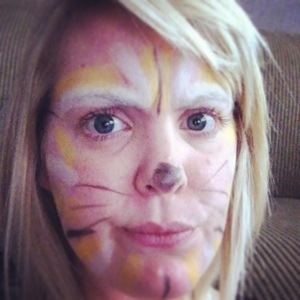 We went up to the bathroom and I painted my face like a tiger whilst he watched. I then asked if he wanted his done, he confirmed with a “yep” and was very still whilst he let me create a growling Dexter. He loved it and kept roaring at himself in the mirror. Dex then took to riding on my back around his room whilst we hunted for food (Peppa Pig). I’ve never heard so much happy babbling come from his mouth and role playing for me was no different from pretending to be a good office worker from Monday to Thursday. The tiger got hungry and tired pretty quick so we chilled in front of the TV with his tea before his favourite part of the day….bath time. 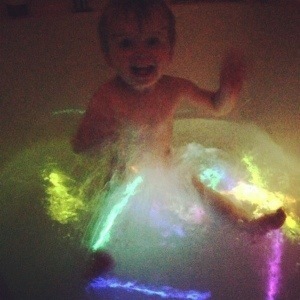 This bath time was a bit different to normal and I splurged out on a glow stick bath. Dex goes mental for the glow sticks, maybe he’s channeling some inner raver. Not a bad bargain from the pound shop and it saves on a bit of electricity. I’m really enjoying the inquisitive, creative stage just as long as he stays away from my nice things!